My digital archive is filled with plenty of old artworks; that I haven’t given credit, nor the honor to display. This illustration was completed a year ago for World of Warcrafts 2011 Calendar art contest. 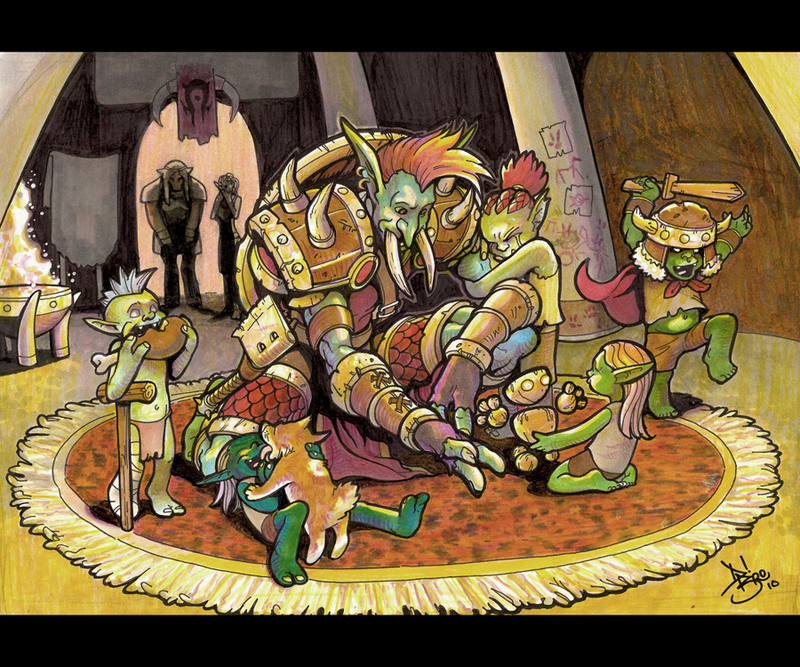 I succeeded in presenting a Troll Shaman in an orphanage with children marveling at his ghastly armor, scrounging his food, entertaining his pets, and hugging his arm. Unfortunately, it hadn’t acceded to the calendar’s edition. Shamed I was. I neglected it. That it became. To adjust a situation, one has to recall. I browsed through my digital archive today to find this piece. Though I had mixed reviews in the past, I think now this illustration is spectacular; it’s the last time I’ve had privileged use of Copic markers- I borrowed them from a friend- very expensive. That is valuable to me- the usage of materials. I did what I intended it to do for me. That is all that matters. That is significant!